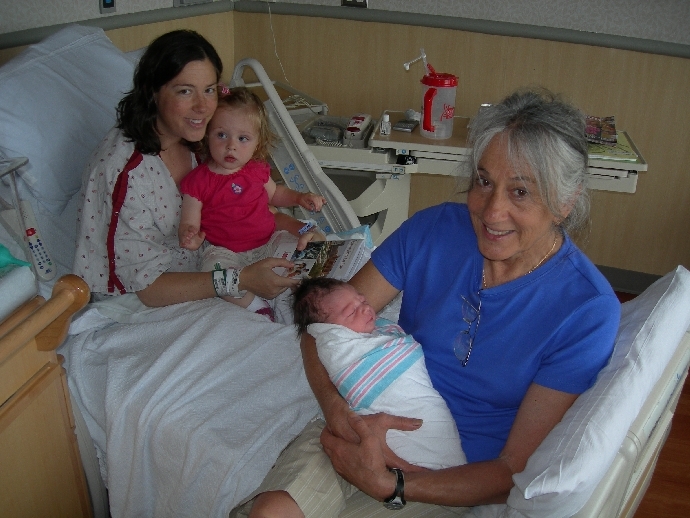 Baby, Mom, and family are all doing well! Helen – Tom has worked really hard preparing the final pages of the blog while I have been working in the yard and around the house. Of course, I couldn’t let him send it off without adding my “two cents worth” but I guarantee it will be short. 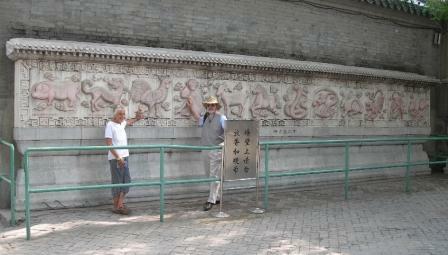 The sites in China were amazing especially the Ming Tombs. The crown jewels were just unbelievable with the gold mesh crowns and the larger ones with all the gem stones and pearls. I have often seen these in posters but to see them up close was a real treat. The Great Wall was “Great” but I enjoyed the hike on the sacred mountain more, maybe because I didn’t “get lost!” The food was exotic; chop stick skills were challenging but proved to be a great way to go on a diet, until the very end when I could actually pick up small pieces of food – and I thought it was hard to eat with my hands in Sri Lanka!!! 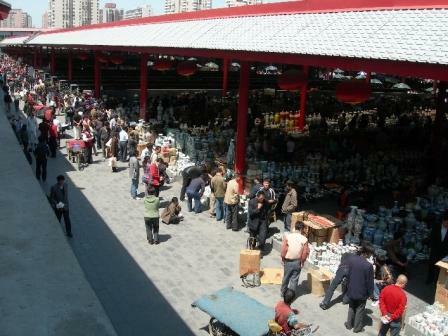 Shopping was plentiful and the “Chinese flea market” was truly the greatest!!! 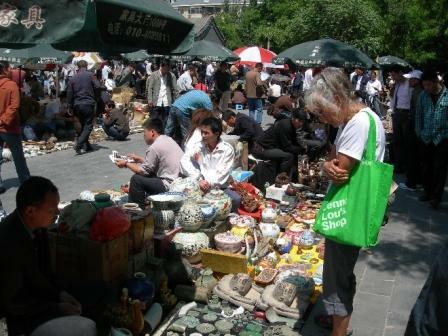 We didn’t even touch the surface of it and had spent several hours there haggling prices and having a good time…several times the other vendors would give me the “thumbs up” smile, and nod their heads after I had agreed on a price. I have always wanted to see the terracotta soldiers and they were beautiful; looking at all their faces was fascinating because each one was different and there were more than 7000 unearthed. So, can you believe that I have highlighted China in one paragraph??? The rest of my thoughts must be captured in a one-to-one conversation. I hope that you have all enjoyed our rambling. On the web you can skip parts but when I begin telling a story in person you won’t be able get away until I am finished! The blog is hereby put to rest – until our next trip!!! The past five months have provided incredible professional and personal experiences. We were in Sri Lanka for four months working, touring and immersing ourselves in the culture. In addition, we have been able to fulfill some lifetime goals, travel to Egypt (e.g. pyramids), India (e.g. Taj Mahal), China (e.g. Great Wall), and fly around the world! 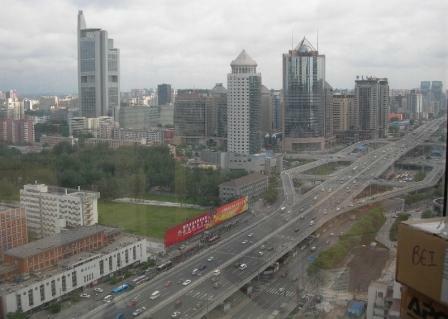 Tom – Joe drove us to the Beijing airport dropping us off at Terminal 3. Unfortunately, our flight left from Terminal 2. Fortunately, we had time to take the shuttle bus and left on a Continental Boeing 777 at 5pm. The plane took the polar route flying over Mongolia, Siberia, Arctic Ocean (near the North Pole – I thought I saw Santa Claus! ), NE Canada (Hudson Bay, etc.) and into Newark arriving at 5pm the same day! We crossed the international dateline, so, despite the 12 hour flight, we arrived the same time we left! The flight to Dayton arrived at 10pm. Ann & Ron were there to meet us with the 4Runner so we could haul our 5 suitcases, two backpacks, computer bag and oversized box containing two pictures bought at a flea market in Beijing – home. Yes HOME – it is good to be back in the US of A! Helen – I can hardly believe that today has finally arrived and we are homeward bound!!!! 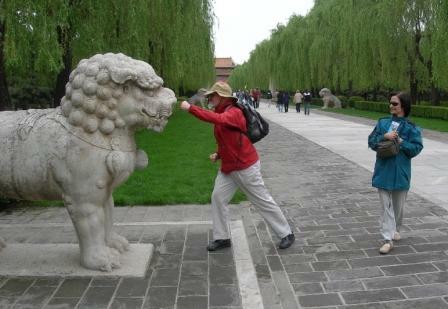 China has been great, gained several pounds from the food (will write about the menus when I get home), have seen wonderful sights, and really enjoyed being with family (Tom’s brother, Joe. and wife, Linda). Even though we have had a fantastic time abroad, we are ready to come home to family and friends and Springfield!!! 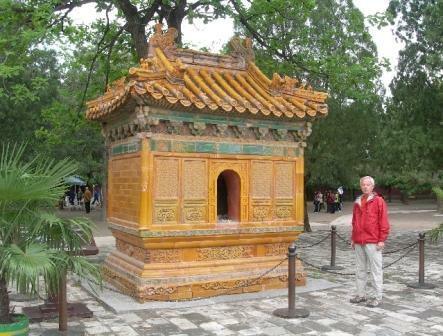 Tom – Today was a cool/cloudy day and it was spent at the Ming Dynasty Tombs an hour NW of Beijing. 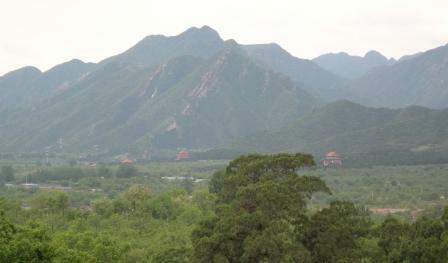 It was a huge area (as usual) tucked in below the mountains. 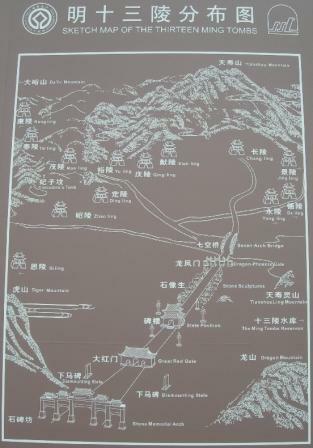 The picture of the map will give you some idea of the size of the Ming Tomb area. 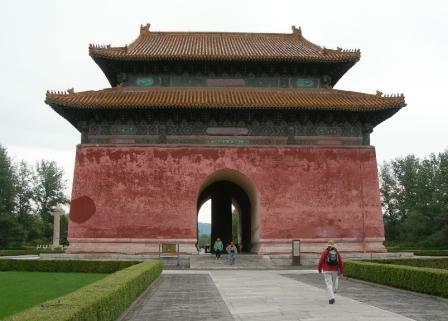 Thirteen emperors are buried here, each with his own burial mound, wall, gates, towers, pavilions, etc. Three of the tomb areas are open for visitors. 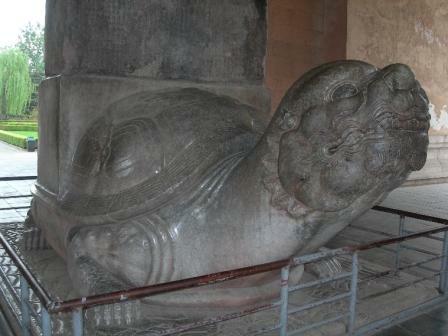 The turtle is a common feature at the base of columns. 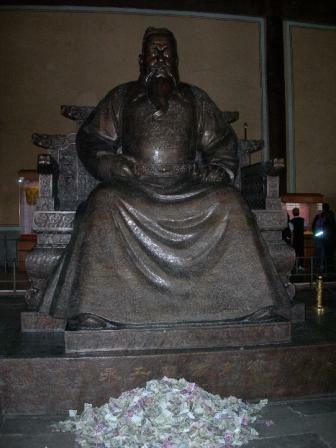 We started at the tomb of Ding Ling. It was excavated in the 1050s and you are allowed to descend into the underground vault. There is also an impressive museum with various burial artifacts. 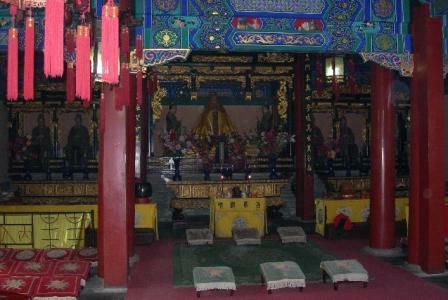 It took ten minutes to drive to the next burial complex, that of Emperor Chang Ling. 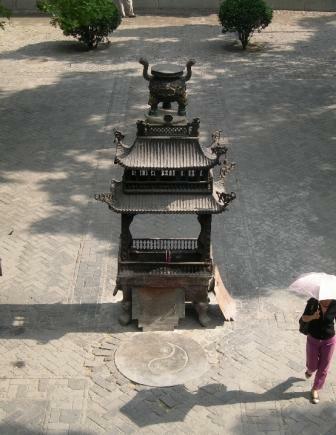 This Sacred Silk Burner (small yellow-tiled building) is in the courtyard. 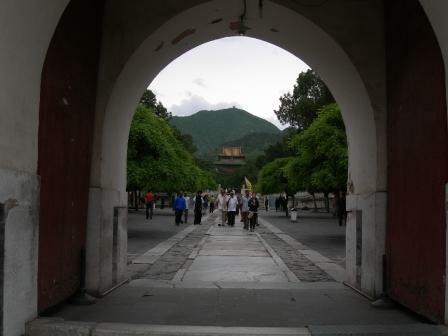 You enter an impressive yellow-tiled gate and then walk through a series of large halls (each a separate building). 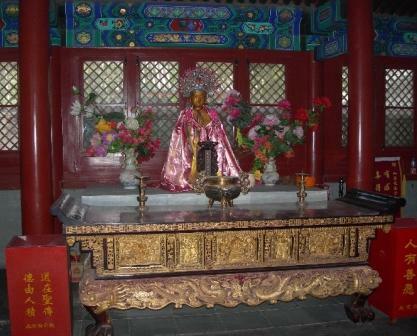 There is a large statue of the emperor seated upon a three-tiered marble terrace in the Hall of Eminent Favors. The roof is supported by at least 20 huge (3 ft diameter) solid cedar wood columns. Earthquake: I was reading a description of one of the golden crowns when the words started moving on me – I thought I might be getting dizzy and couldn’t figure out why. 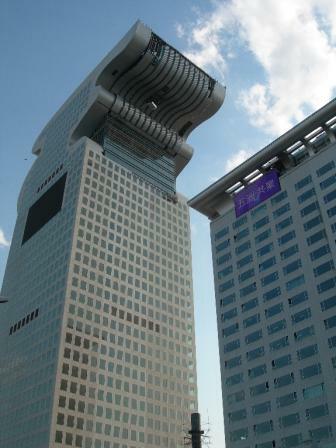 When driving home Joe got a call from his office saying a 7.9 earthquake had hit in Sichuan Province outside of Chengdu and they had sent everyone home because their 24 story building in downtown Beijing was swaying. 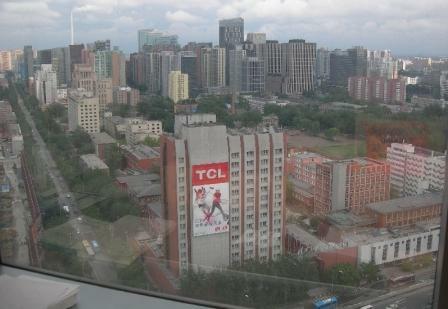 The time of the quake was 2:30pm – when I had trouble reading the sign! 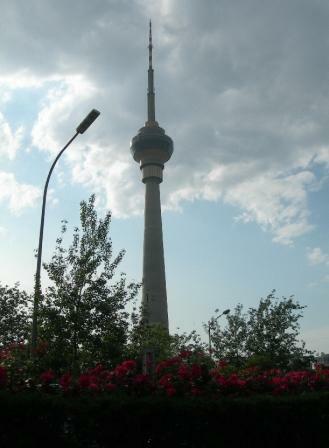 The current estimate (May 22nd) is that 75,000 people were killed. Our taxi driver, who was with us all day, then drove us to the entrance to the entire tomb complex. 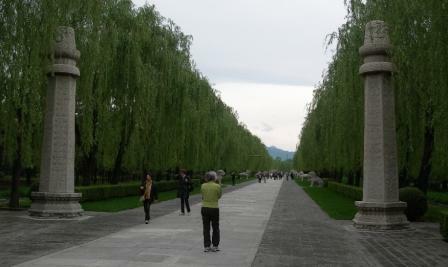 It is called the Spirit Way and is about 4 miles long. He dropped us off at the entry triumphal arch and later picked us up about a mile north. We walked through the Great Palace Gate (Red Gate) and proceeded up the Sacred Way (God Street) along the route the burial processions would take. 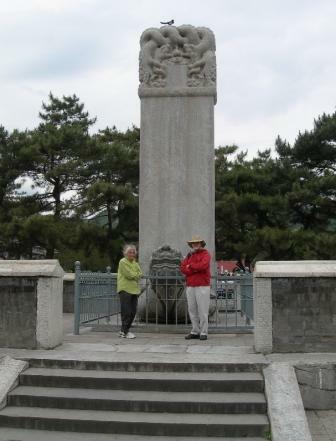 The largest stelae (inscribed tablet) in China is located here inside of a pavilion. 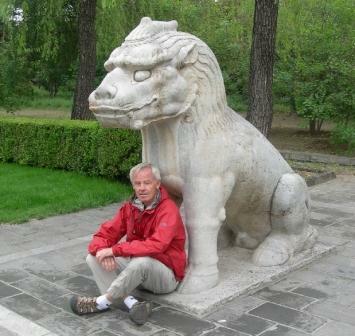 Like many in China, it is supported by a mythical tortoise-dragon-like animal. 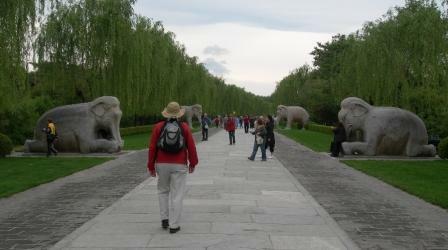 The “Sacred Way” has two large columns with a cloud design on all sides and then is guarded by a series of large stone animals and officials. 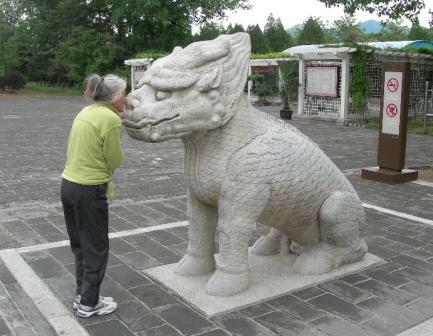 and Helen appears to be rubbing noses with a Qilin. 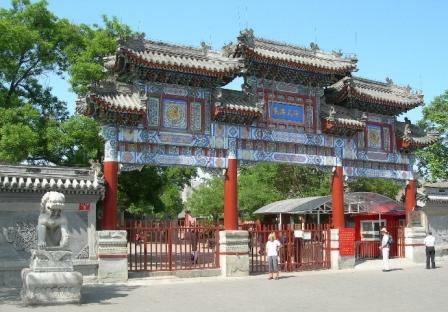 After passing through the Longfengmeng Gate (Gate of Dragon and Phoenix) we were picked up and headed back to Beijing. Mothers Day! 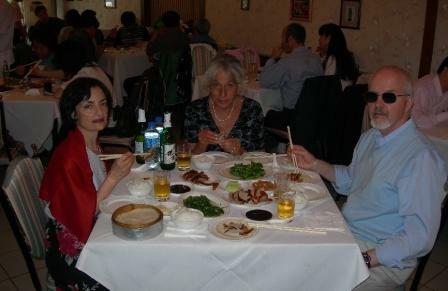 Tom – After attending non-denominational services with Joe and Linda, we walked to a restaurant called Beijing Duck for lunch. 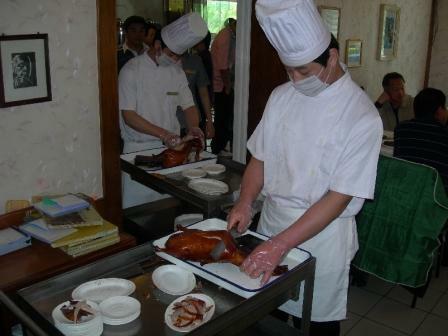 We ordered the national treat – Peking roast duck! We then went to the Lufthansa Hotel for coffee and dessert. 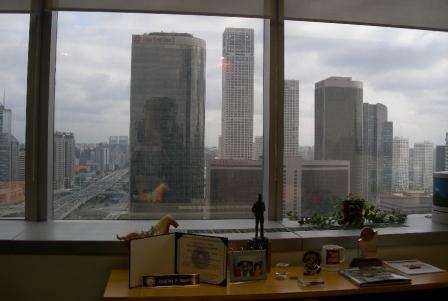 On the way home we stopped by Joe’s office to pick up his mail and I took some pictures out of his 23rd story windows. Helen – Today was my day!!!! 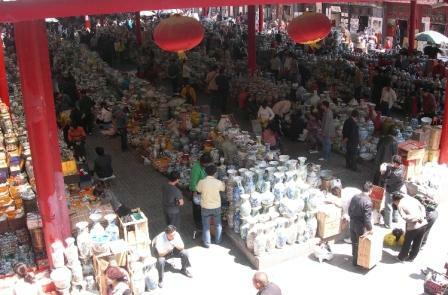 Tom and Joe took me to the largest flea market in China!!! We couldn’t even begin to see it all but I did enough damage in the three hours of shopping. The vendors thought I was very good at bargaining and kept giving me the cut throat sign as we had a price war and then gave me the thumb’s up at the end. 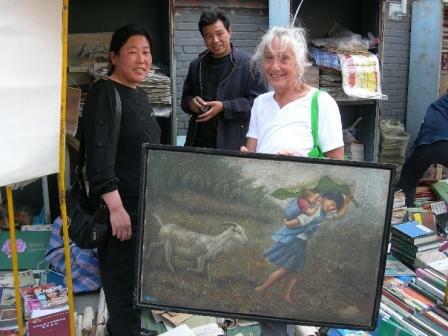 One of my prized purchases was a painting of a girl carrying a baby followed by a goat for $45. 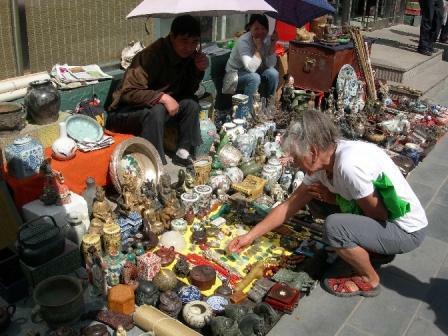 Lots of statues and incense and bowing…. it went on forever even though it looked relatively small from the entrance. 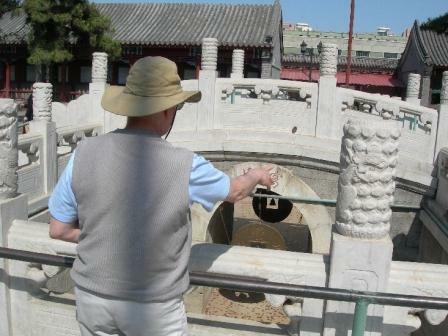 There was a wishing bell near the entrance….it was enclosed in a large Chinese like coin that was hanging down in a pit. You bought 50 throwing coins for $1.50 and then threw them at the little bell. If you hit the bell, then your wish should be granted. Tom and Joe shared the 50 coins. Joe hit the bell once and Tom hit it three times. Twelve Chinese Zodiac birth signs/years – Helen’s (1945) is a rooster and Joe’s (1950) is a dog, though he has his hand on a monkey. They were both born under the Aquarius sign according to their birthdates and the Western monthly astrological signs. 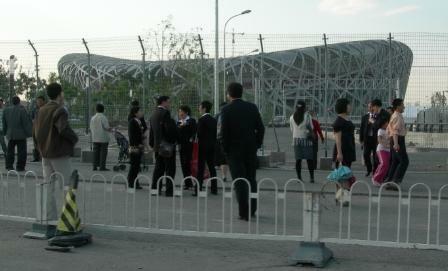 and the “Water Cube” (shaped like bubbles) for the swimming events. They are not open to the public yet but we drove pretty close to get a good look. 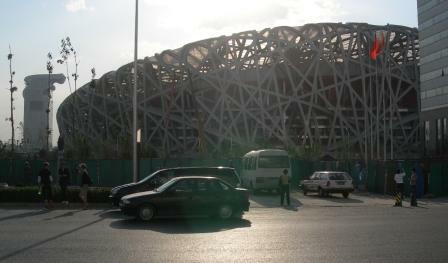 The facilities are impressive, however, we think people going to the Olympics are going to be surprised and upset with the air pollution, traffic and costs, let alone the difficulty in communicating. There are relatively few people who can speak English and foreigners are not going to be able to read or pronounce Chinese figures. You are currently browsing the The Martin's Blog blog archives for May, 2008.